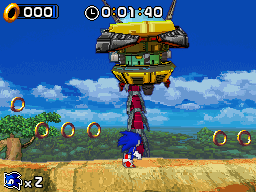 The Egg Hammer Mega is Sonic's first and Blaze's second boss fight in Sonic Rush for the Nintendo DS. On a giant tree branch high above the canopy of Leaf Storm, the heroes fight Dr. Robotnik, who is piloting this odd cross between a robot snake and the Egg Hammer III of Sonic Advance 3 fame. Usually in Sonic Rush, Blaze fights Ivo Robotnik while Sonic battles Eggman Nega piloting the same machine. This is the only case in the game where Nega is nowhere to be seen, and both characters fight the regular Eggman. Before the boss, Eggman taunts Sonic by claiming that soon, "ultimate power" will be within his grasp. Blaze exchanges no similar pleasantries during her playthrough and simply wades right in to the battle. Run back and forth until he finally slams his head into the ground. Switch directions suddenly if you're having difficulties shaking him. Be careful that you don't accidentally run under him while he's slamming his head. Stand still. Wait until his head starts coming back down and then quickly run out of the way. Start charging a Spin/Burst Dash and release it as soon as his head begins to come back down. Use this method only in emergencies, as the first two are the best to use since they will make it easier to land hits on the boss, especially when his health is low. The boss will scream "Get ready to be schooled!" while dramatically shaking and pulling back his head. Eventually he will slam his face into the floor in an attempt to crush you. To dodge, simply stand still and wait until you can no longer see his head, then run out of the way. He will not make any attempt to follow you unless you run away while his head is still visible. The boss will move to the side of the arena, lean down and place his head onto the ground. The camera will turn and the head will begin to spin then roll at you. As his health gets lower the head will roll at you 2 or 3 times in a row before he picks it back up. To dodge, run at the head and hold Up on the D-pad as you jump over it. Make sure that you jump a little before you reach the head, otherwise it'll catch you and send you flying off the edge. When the boss is defeated, Eggman drops the blue Sol Emerald. In Sonic's story, Blaze suddenly appears in a cyclone of fire and takes the gem, running off before Sonic can say a word to her. The ophidian boss machine later reappears in the Huge Crisis boss. This page was last edited on 8 April 2018, at 08:55.